Our Mt. Olive pickle products and relishes make the perfect addition to a variety of recipes. 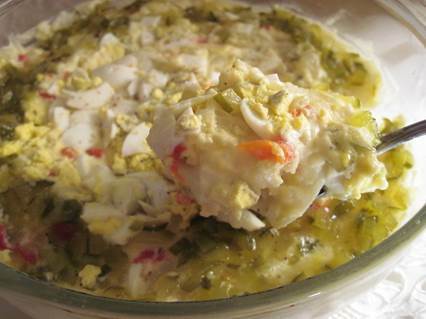 For example, blogger Cornbread Millionaire created this potato salad recipe using our Mt. Olive Sweet Salad Cubes. 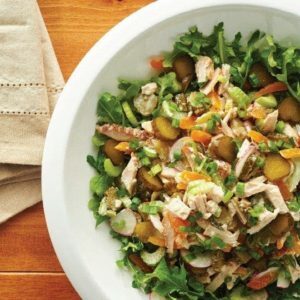 You can also try Sweet Relish or Dill Relish instead of the Sweet Salad Cubes. Have you created your very own recipe using one of our products? Share it with us here! Thoroughly wash potatoes. Do not peel. Set aside. Add 2 cups of water to a large saucepan. Stir in ½ teaspoon of salt. Add washed potatoes. Add more water to cover. Simmer over medium-high heat until fork tender and potatoes break easily. If they are hard/crunchy, boil 5-10 minutes longer. Rinse fork-tender potatoes in cold water. Cool 15-20 minutes. Peel. Cut into bite-sized pieces. In a medium-sized bowl, combine potatoes, chopped eggs, onion, sweet salad cubes (or relish), and chopped pimentos for color (if using). Add mayonnaise one tablespoon at a time until satisfied with creamy texture. Add mustard a little at a time until satisfied. Season with salt. Stir together. To garnish, use a sifter to lightly sprinkle paprika over top of prepared potato salad. This step is optional. Serve immediately. Or, cover and refrigerate until ready to serve. Although delicious immediately after preparation, it tastes better the next day.